In an unusual case (no pun intended), the .17 WSM (Winchester Super Magnum) was created based on the .27 blanks typically used in nail guns, but necked down to fit a smaller caliber bullet. 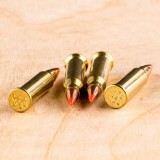 It is a very high velocity cartridge firing a spitzer bullet that performs well in a small game hunting role. 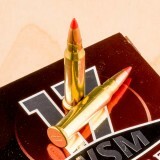 .17 WSM ammo loads fire a light 20-25 grain bullet at a muzzle velocity of up to 3,000 feet per second. 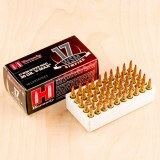 This high velocity aids fragmentation in hollow points for better performance against varmints. Winchester and Hornady are the main manufacturers for this caliber; their ammo features polymer tipped bullets with high ballistic coefficient for accurate medium-range hunting. 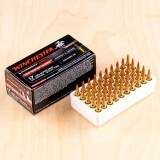 With over 150 years of tried and true manufacturing experience, Winchester makes some of the best ammo on the market. As America's second oldest weapons and ammunition manufacturer, you can't go wrong with Winchester. 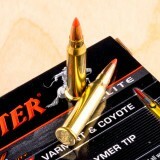 Their Varmint HV line of ammunition is specifically designed to have massive expansion to make killing varmints easier. 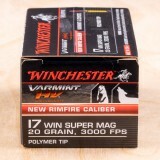 If you've got a varmint problem, 17 Win Super Mag is there for you. As a tiny round, this round is inexpensive, but still very effective against the critters of the night. 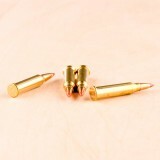 With these 20 grain, polymer tipped bullets, slay those pesky trash eaters and chicken killers that have been bothering you for weeks. 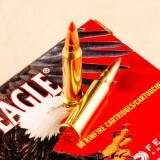 When you are looking for one of the most effective rounds for varmint, predators, and small game, few cartridges excel like this one from Federal Premium Ammunition. Using a 20-grain bullet, this round has a muzzle velocity of 3,000 feet per second, making it one of the fastest small game rounds you can find. Thanks to it’s speed and design, it is amazingly accurate for a small-caliber cartridge. When sighted to 100 yards, this bullet only drops 1.2 inches to 150, making it an incredibly reliable shot for medium-range varmint hunting. It should be noted that a crosswind can effect this small bullet. A 10 mile wind will push the round about 4 inches to the side at 150 yards. 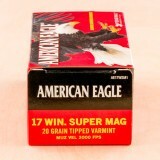 This cartridge is made by Federal Premium Ammunition, a leader in high-quality cartridges for hunting and target shooting. 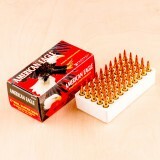 They have ammo for handguns, shotguns, rifles, and more, making them a favorite among many American gun owners. When you need a top-quality .17 WSM ammo for varmint hunting, this is the round for you. You’ll get outstanding speed and explosive expansion, allowing you to deliver accurate, consistent shots to varmints or a target. 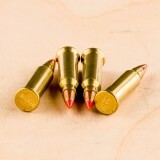 These rounds have an advanced design, highlighted by Hornady's famous 20-grain V-MAX bullet. You can count on these 17 WSM rounds for outstanding speed, accuracy, and terminal ballistics. They come flying out of the barrel with an initial velocity of 3,000 feet per second and an energy of 400 foot pounds. Even when they reach 200 yards, they maintain a speed of 2,060 feet per second, giving you excellent performance at longer distances. You can count on these bullets to deliver consistent results at the range or in the field. 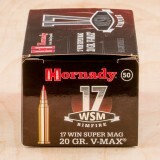 Hornady is one of the leading manufacturers in rimfire ammunition and really, all ammo types. This company has been making excellent products since 1949 and has products for hunting, target shooting, and personal protection.